Well, this is not exactly a cream. Actually, it’s more like a jelly. A creamy, smooth-bodied jelly, flavoured with new-season apricot. 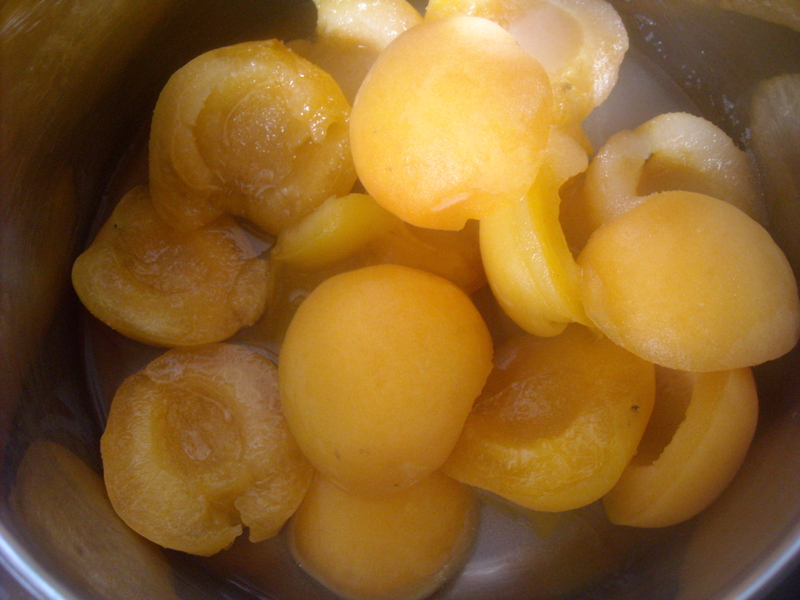 INGREDIENTS – 12 to 16 ripe apricots, 1/4 lb. 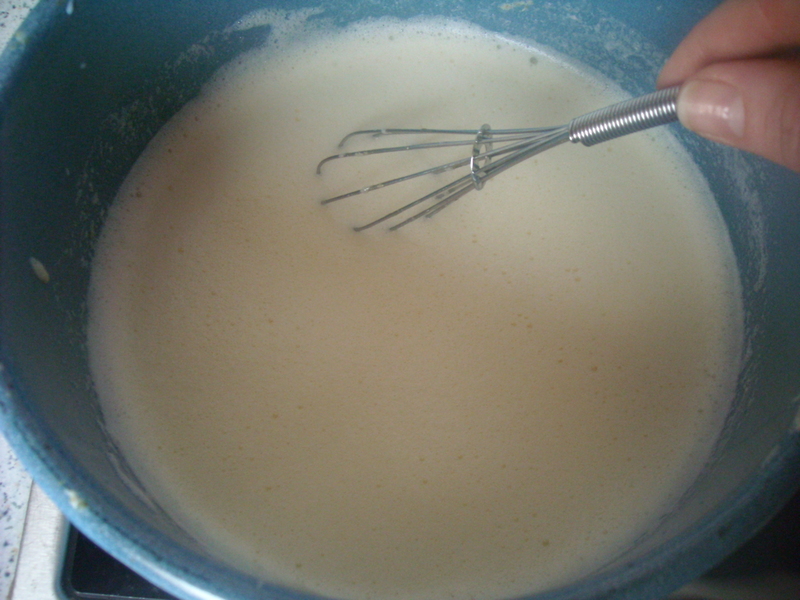 of sugar, 1–1/2 pint of milk, the yolks of 8 eggs, 1 oz. of isinglass. We had a friend coming round for dinner, and I wanted to make a light dessert to go with the after-dinner coffee, as well as to satisfy my boyfriend’s insatiable sweet tooth (if I haven’t mentioned this already, he typically takes 3 HEAPED tablespoons of sugar in his coffee. And he drinks a minimum of 5 cups of coffee a day. Despite my horrified retching whenever I catch him flavouring a mound of sugar with coffee, I’m still waiting for him to develop diabetes or for his teeth to fall out, to provide me with a smug ‘I told you so’ opportunity. Alas, so far the gods are on his side…). This is a simple, 2-stage dessert to put together. 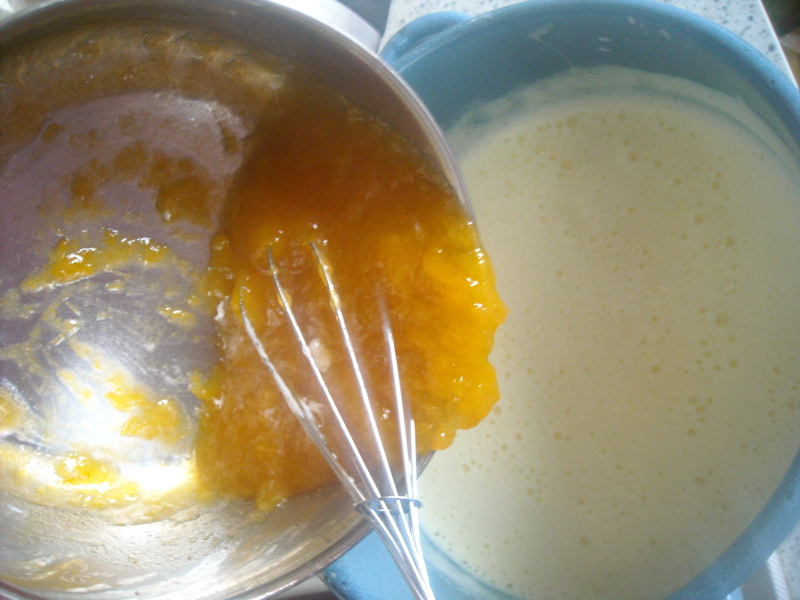 Firstly, an apricot compote is made by boiling the fruit in a sugar syrup, then it’s mixed together with the other (pre-simmered) ingredients. The recipe calls for 1/4 lb of sugar, but this is a mistake – it actually needs 1/2 lb sugar (as discovered when I read the recipe process steps). I just made half the quantity as the dessert was only for three people. Still, I couldn’t quite bring myself to use 4 egg yolks (cue some cheeky, grinning tut-tutting from my boyfriend, and his perpetual crow of ‘What would Mrs Beeton say?’ when I balk and gasp at some instruction or other). Even with three yolks, it didn’t seem to adversely affect the final outcome. And boy was our oldest, greediest cat Saturn excited when she was given the fried-up egg whites as a treat! As with the previous Mrs Beeton jelly-like dessert I made, I substituted agar agar for isinglass (I’ve never even heard of isinglass for cooking before I ‘met’ Mrs Beeton, anyway). This time, I was a bit savvier with the quantity, and added slightly more agar agar to give the dessert a firmer consistency and appearance. Despite the amount of sugar used, and despite it being a really nice dessert (especially when served with vanilla ice-cream), it wasn’t quite sweet enough even to my taste. Perhaps it’s something to do with the agar agar, which smells a bit like chlorine (but, thankfully, doesn’t taste like it – I don’t want to be thinking of swimming pools when I’m eating dessert!). 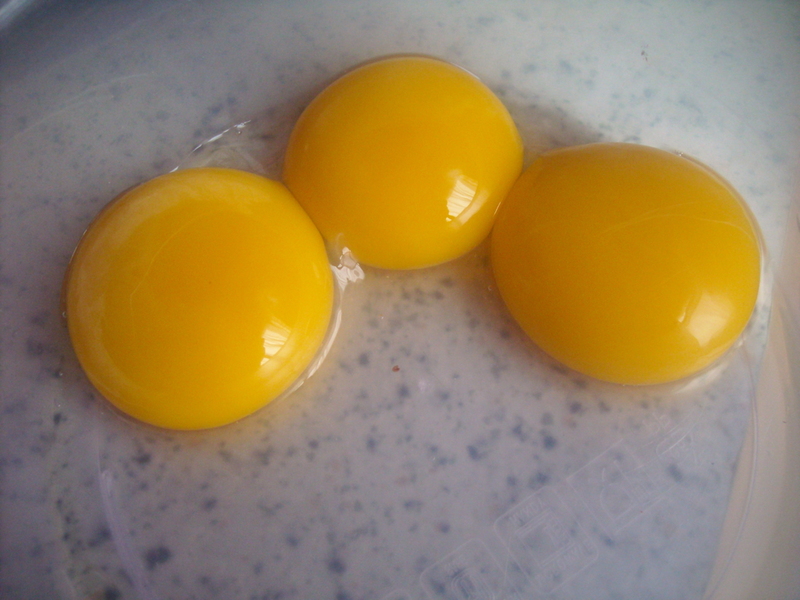 “Maybe you should’ve used 4 yolks like she told you to,” grinned my boyfriend wickedly. Maybe. Perhaps. It’s possible. 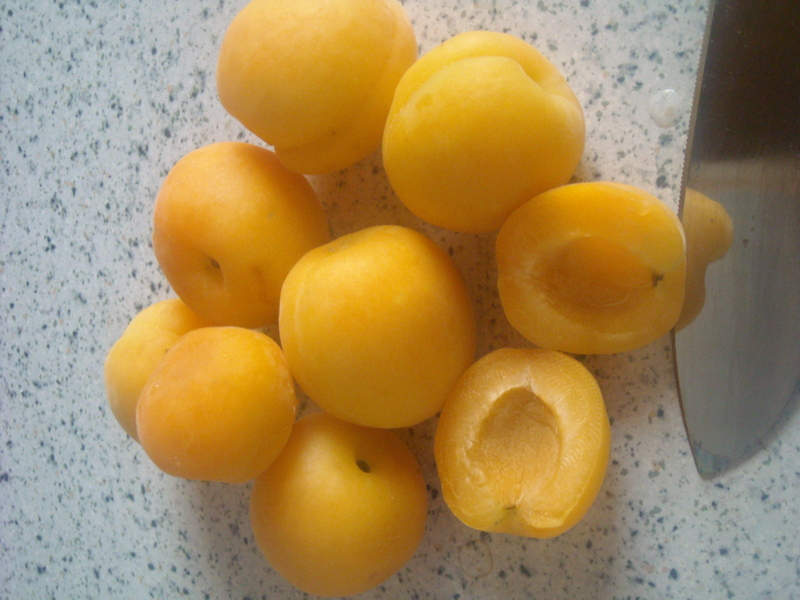 But, I’m more inclined to blame it on the apricots I used, which were rushed-to-the-shops, early season specimens and not as fruitily, robustly ripe as they will be in a few weeks time, when the season is in full-swing. Roll on spring and summer, with the glorious bounty of fruit and vegetables you usher in with you! 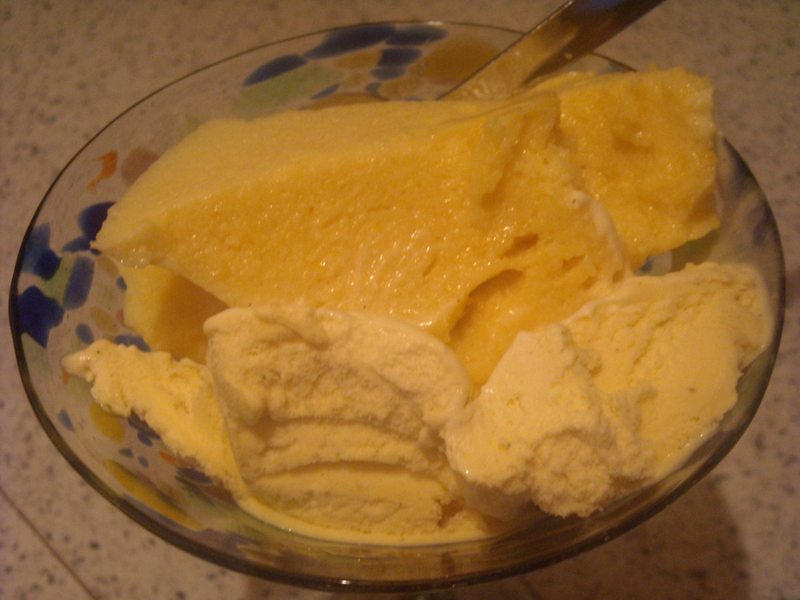 This entry was posted on June 4, 2010 at 5:44 am and is filed under food. You can follow any responses to this entry through the RSS 2.0 feed. You can leave a response, or trackback from your own site.